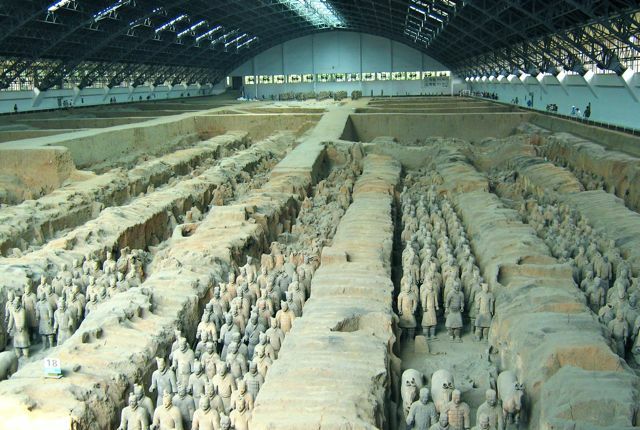 Xi’an is the city in China where the Qin Dynasty Terra Cotta Warriors were discovered. 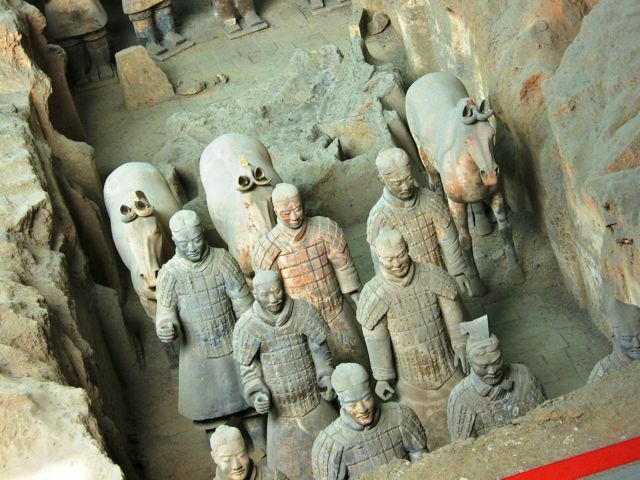 The Qin Dynasty Terra-cotta Warriors are part of a larger story, the story of China’s first emperor, Emperor QinShihuang. He unified China, established a centralized state and put an end to the former feudal system. He standardized weights and measures, as well as monetary, legal and writing systems. 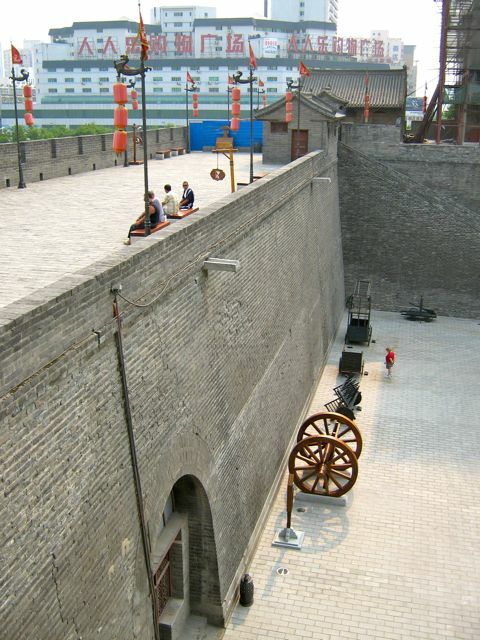 He also connected individual protective walls into the Great Wall of China. Chinese history records that as soon as an emperor ascended the throne, he began the construction of his tomb. Emperor QinShihuang went beyond that; he created a subterranean palace with a protective outer wall with watchtowers and gates leading in four directions. And, of course, a life-size army of thousands, arranged in battle formation and armed with spears, halberds, cross-bows, swords and Pi—a bayonet-like weapon—to guard the palace. He believed that life under the ground after death would be a continuation of life on earth. Emperor QinShihuang’s craftsmen and slave labor took several decades to build everything, but all his plans were never completed. The ancient wall guarding the old city. The starting point of the Silk Road, today Xi’an is a mega-city of more than six million people and a business, cultural and educational center that hosts international events. 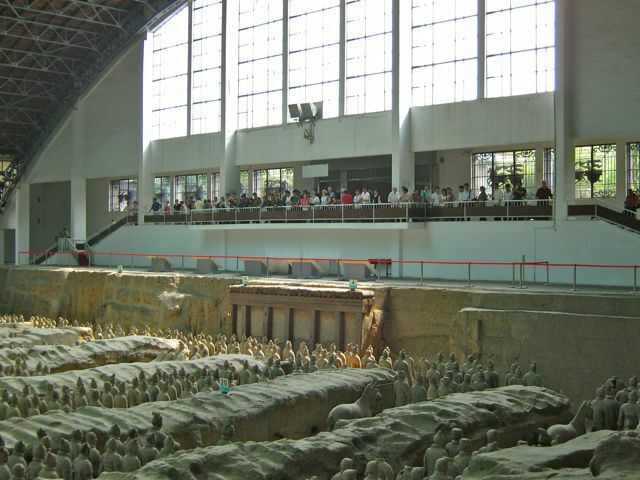 The Terra-cotta Warriors—the top archaeological find of the 20th century—put Xi’an on the map as one of the world’s top cultural tourist destinations. On March 29, 1974, farmers from nearby XiYang Village, drilling in several locations in a search for water, discovered pottery fragments and ancient bronze weapons. Archeologists working diligently in one of the covered excavation pits. 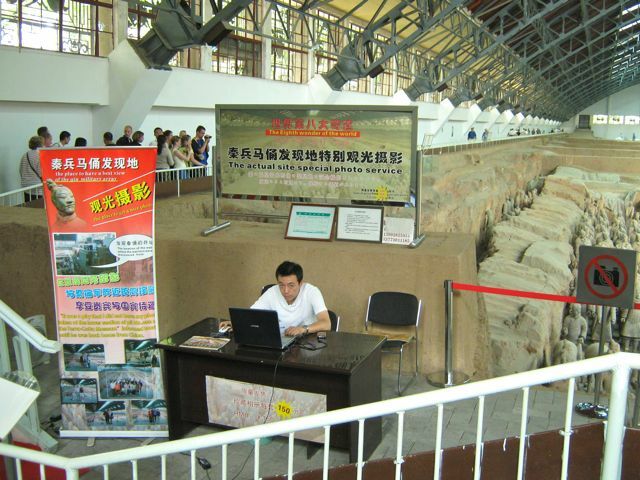 Immediately the head of the village reported the findings to the local government, and on July 17, a Shaanxi Province archeological team sanctioned by the National Historical and Cultural Relics Administration arrived to begin exploration and excavation. During my exploration visit to today’s Terra-cotta Museum, one of the farmers who found the pit was signing souvenir coffee-table books. Naturally, I had to buy one. He gracefully autographed his name—I assume—with a Chinese brush pen. 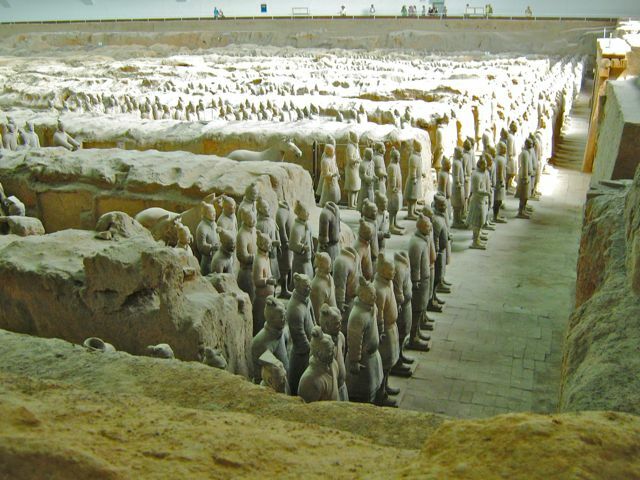 On the east side of Emperor QinShihuang’s mausoleum is the Terra-cotta Museum. There are three main buildings covering the current three excavation pits. The entire complex occupies 20 hectares. To date, about 1,800 statues have been excavated. 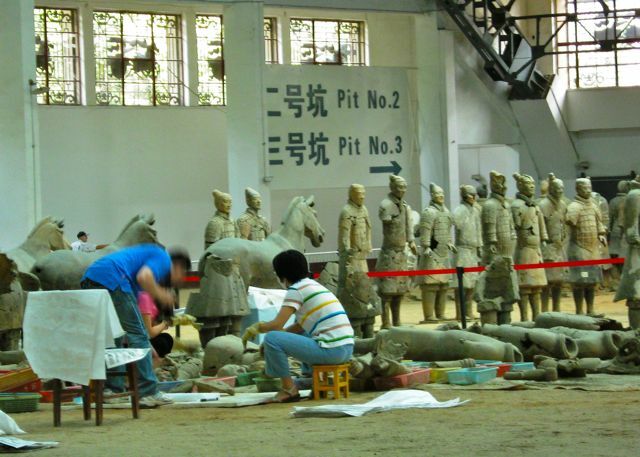 Yet most of the complex is still uncovered and it’s believed that more than 8,000 pottery warriors—mostly infantrymen—and horses will be unearthed. And innumerable valuable cultural relics remain to be discovered. A remarkable discovery is that no two of these life-size warriors have the same facial features. It is thought that real soldiers posed for each individual statue. And these guys were tall by historic comparison—averaging 5’ 10”. Each was composed of local clay, fired into ceramics that were then colorfully painted, but time has eroded most of the colors. Two pits contain life-size painted bronze chariots with four horses. What maddened archeologists for years was the quick eroding of colors once the pieces were excavated. Recently, with the cooperation of German archeological experts, a coating was developed that, when immediately applied to an unearthed object, can keep the original paint from fading and flaking after exposure to air and light. 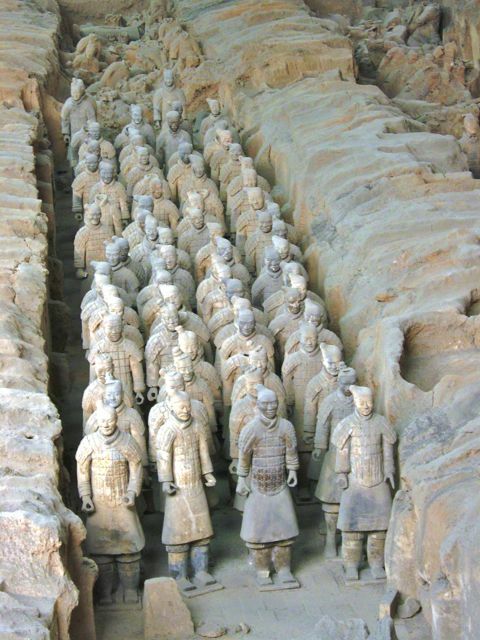 In order to keep the location of Emperor QinShihuang’s mausoleum and underground palace a secret, his son ordered thousands of officials to be killed and thousands of craftsmen to be buried alive. Certainly, this place must be haunted! Emperor QinShihuang himself was obsessed with a fear of death and expended a lot of resources in his search for immortality. Still, he died at 50. Though his Qin dynasty only lasted 15 years, it laid the foundation and greatly influenced the success of future dynasties. 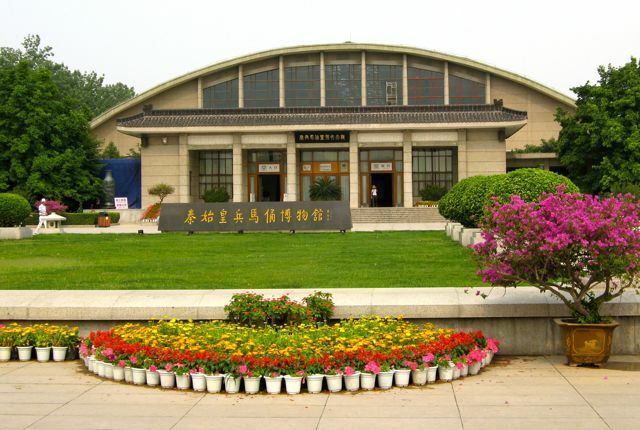 On October 1, 1979, the Terra-cotta Museum opened to the public. In the last 20 years it’s become the largest on-site museum in China. 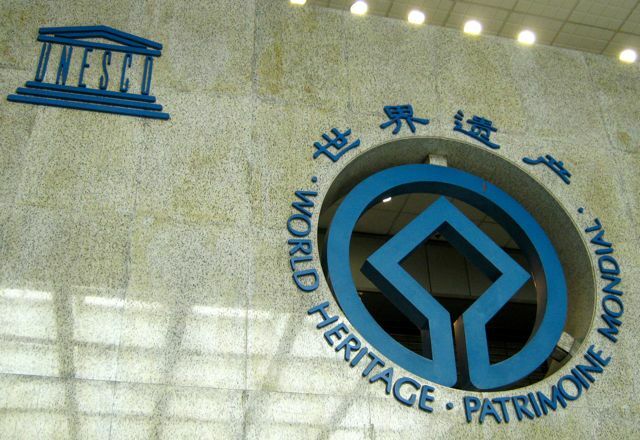 In 1987 this historic and scenic area outside Xi’an city was designated by UNESCO as a World Heritage Site. A huge, arch-domed steel structure, located at the center of the museum covers Pit One. Two million tourists now visit annually, and 50 million have visited since the museum opened in 1979. "The Actual Site Special Photo Service" Not sure what this guy does, but he looks important. 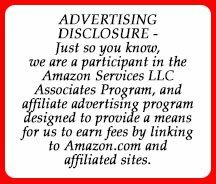 For you fact-a-holics who want more info, CLICK HERE. To see a cool 3-minute video of the warriors, CLICK HERE. 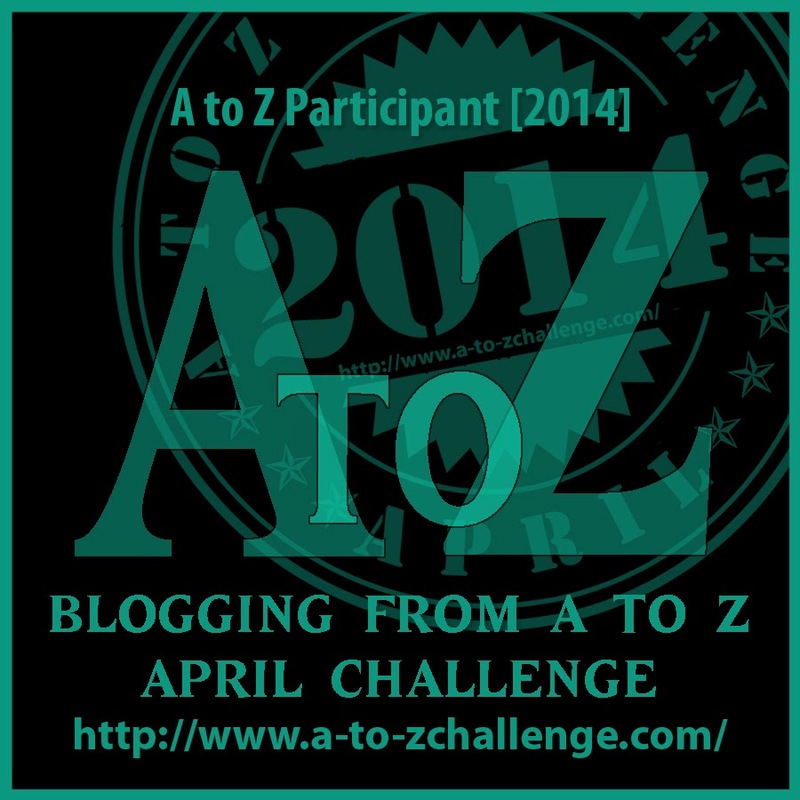 Tomorrow’s A to Z Blog Challenge: For the letter Y, I’m going to tell you about my experience teaching an English class on a Yangtze River cruise.